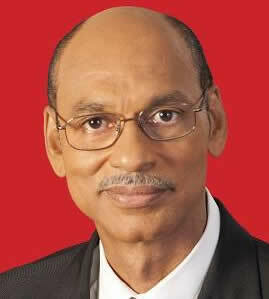 Ronald Toppin is a Barbadian politician and a current Cabinet Minister. Widely regarded as the as the model representative, it is no wonder that Ronald St. Clair Toppin has for six unbroken terms been the member of Parliament for the constituency of St. Michael North. Born on 4 January 1958, Ronald St. Clair Toppin was educated at the Wesley Hall Boys School and Harrison College, before studying Law at The University of the West Indies, Cave Hill, where he won the prize for best academic results in the Faculty of Arts and General Studies in the academic year 1976-1977. In 1977, he also earned the Grantley Adams Fellowship for Law, an award that was presented annually by the Lions Club of Barbados, again based on his academic performance at the university. 1980. In 1982, after earning the Legal Certificate at the Hugh Wooding Law School of the University of the West Indies, St. Augustine, he was admitted to the Barbados Bar and has been a practising Attorney-at-Law since then, except when he was a Government Minister. Toppin entered elective politics in 1991 and became the MP for St. Michael North in 1994. He served in Cabinet from 1995 until 2003. During the years 1995-1999 he served as Minister of State in the Ministry of Foreign Affairs, Tourism and International Transport. In 1999, upon the re-election of the BLP, he assumed the position of Minister of Commerce, Consumer Affairs and Business Development. As Minister of State he successfully negotiated air services agreements with other countries and was responsible for the commencement of flights into Barbados by a number of airlines, including Virgin Atlantic out of London and Air Jamaica out of New York. As Minister of Commerce, Consumer Affairs and Business Development, he introduced a significant number of Bills into Parliament, resulting among other things, in the establishment of the Fair Trading Commission and focused primarily on consumer protection. Important legislation now in force as a result of Mr. Toppin’s work are: the Fair Trading Commission Act, the Utilities Regulation Act, the Fair Competition Act, the Small Business Development Act, the Bankruptcy and Insolvency Act and the Electronic Transactions Act. He also established the Office of Public Counsel and the Consumer Claims Tribunal which give consumers the opportunity, free of cost, to enforce their rights against companies and businesses. He returned to private practice as an attorney in 2003. Toppin was relected to the Barbados House of Assembly in the 21 February 2013 General Election. Toppin retained his seat in the 24 May 2018 election and was appointed Minister of International Business and Industry in the Mia Mottle Administration. Toppin is the father of two daughters, Priscilla and Raquelle. His recreational interest are cricket, reading and music.